I will explain SAP S/4 HANA System Architecture more easily. In order to understand the S/4 HANA System, it is necessary to understand the SAP ERP System in advance. It is necessary to understand the system configuration of SAP ERP 6.0 and SAP NetWeaver 7.0, and then describe the S/4 HANA System configuration. I’ll do it. There are Cloud and On Premise methods on how to configure the System Architecture of SAP ERP 6.0 and S/4 HANA. I will describe the S/4 HANA System Architecture from the On Premise viewpoint, but not all of the S/4 HANA System Architecture described here as the On Premise method for the Cloud environment. First, I will describe the System Architecture for SAP ERP 6.0 and NetWeaver 7.0. SAP’s Software is about the release year of ERP and S/4 HANA. 2.I will explain the concept of connecting from the user PC to the server which is the most basic to configure all applications. Typical business applications are business processes, such as Zeus, Apache Tomcat, and WebLogic. The SAP ERP System also belongs to the middle part of the application logic. 3.I will first explain the terminology used in SAP and explain SAP Application. The terminology used in SAP is not established from the beginning, but it comes out with SAP products (ERP, BW, CRM, SRM, SCM, etc.) I will explain. I will describe the terminology of SAP System, SAP Instance, and Process in detail. SAP System : Software with SAP Solution installed. The SAP System consists of one Database and several Application Server Instances. SAP Instance : It is a group (bundle) of resources. These resources include memory, work processes, dispatchers, and Kate Way. SAP Instance is a unit provided by Services. Here we talk about offering various products of SAP as a service concept. To provide services to individuals, resources are grouped into groups to provide services to individuals. The bundle of resources is called SAP Instance. – Dialog Instance : The Dialog Instance is in the Application Level, and the Dialog Instance is where the general user handles the response when accessing it. Dialog Instances can be located in other Servers (hosts), and the resources can be distributed and located. You have to increase the hardware resources on the ground and increase the number of dispatchers and work processes accordingly. – Central services Instance(SCS) :Instance is composed of Message Server that performs communication between Instance and Enqueue Server that manages Lock. 4.SAP NetWeaver AS for SAP ERP 6.0 ABAP System provides a graphical illustration of how SAP Application Server handles business processes when accessing SAPGUI from a user PC. 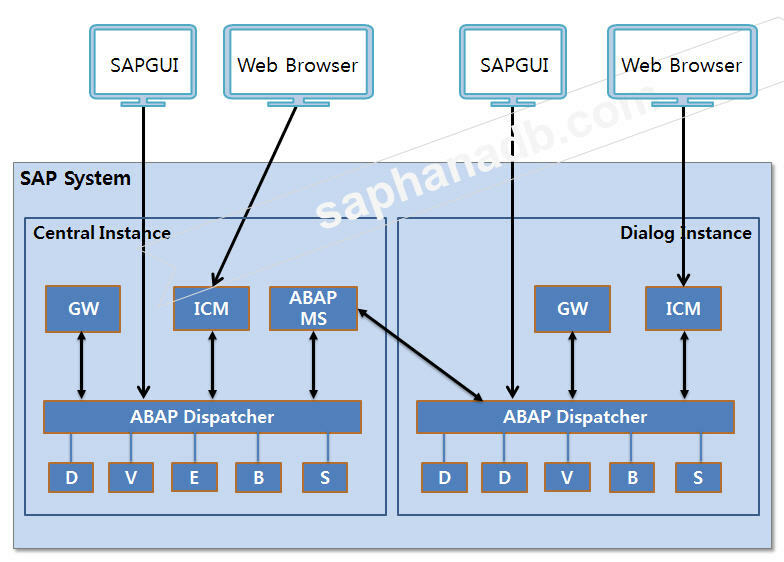 When the SAP ERP system is connected to the SAPGUI from the user’s desktop PC, the ABAP Dispatcher first receives the user request and delivers the user’s request to the Dialog Work Process. Unlike SAPGUI, when a user connects to Web browser called Chrome or MS Internet Explorer, ICM (Internet Communication Manager) is accessed first, user request is received, and the contents requested by user are delivered to Dialog Work Process. 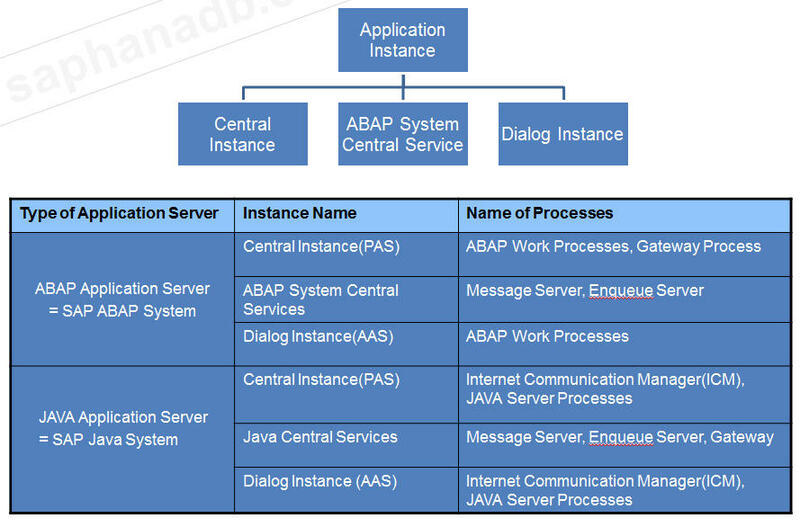 5.Describes the configuration of Central Instance (CI) and Dialog Instance (DI) in SAP NetWeaver 7.0. 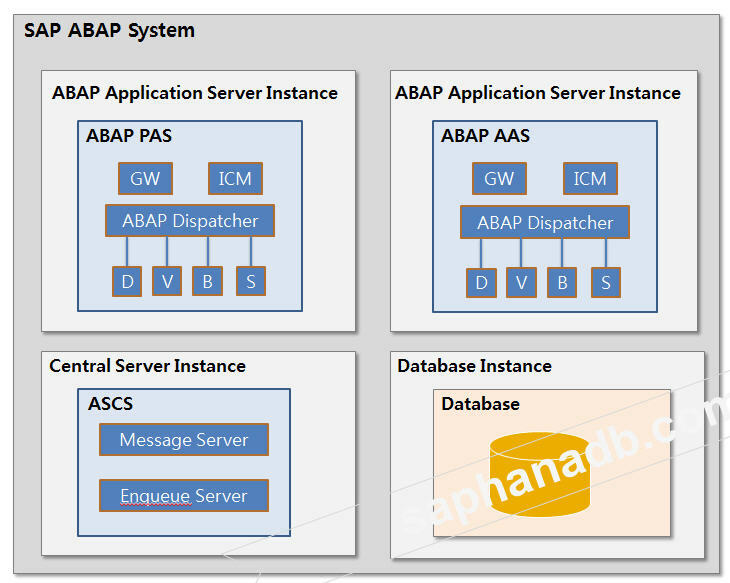 The Central Instance (CI) is a configuration that includes an ABAP Message Server (MS) and an Enqueue Server. The CI must have an ABAP MS (Message Server) and an Enqueue Server. 6.I will show you the new changes in SAP NetWeaver 7.1 and later. You can see the new addition of Start Service and ASCS. The ASCS Instance is configured as a separate server so that the previous version of NetWever 7.0 can exist as a Message Server in the CI (Central Instance), which can reduce the load on the CI. High Availability (HA) can be configured. 7.In SAP NetWeaver 7.1 and later, the terminology has changed. I will explain the changes in SAP NetWeaver 7.1 and above, explain the reasons for the changed terms, and what are the advantages of doing so. In SAP NetWeaver 7.1 and above, the biggest change is that the Central Instance (CI) existing in versions prior to NetWeaver 7.0 is divided into ASCS and PAS. Message Server and Enqueue Server existing in Central Instance (CI) are configured in separate H / W (ASCS), and the Primary Application Server (PAS) is configured with the CI minus the Message Server and the Enqueue Server. So PAS performs the same function as DI of existing NetWeaver 7.0. Dialog Instance (DI), which existed prior to NetWeaver 7.0, has been renamed to Additional Application Server (AAS). In the next step, we’ll compare the changes in NetWeaver 7.0 and NetWeaver 7.1 and make them easier to understand. 8.We will discuss changes to the System Architecture for SAP NetWeaver 7.0 and NetWeaver 7.1 and later. The biggest change is that you can configure the SAP System separately from the newly created ASCS in NetWeaver 7.1. 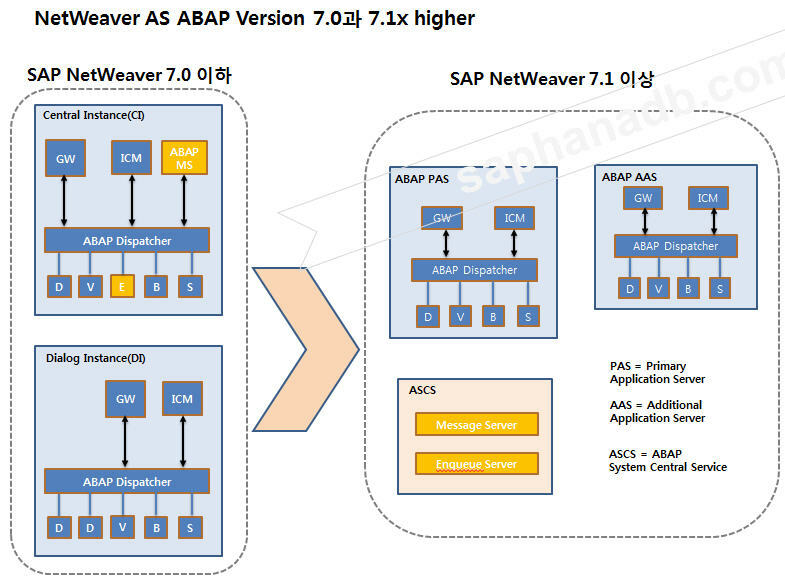 In SAP NetWeaver 7.0 and earlier, the Central Instance (CI) has changed from NetWeaver 7.1 or later to Primary Application Server (PAS) and ABAP System Central Services (ASCS). DI (Dialog Instance) changed from NetWeaver 7.1 or later to AAS (Additional Application Server) in SAP NetWeaver 7.0 and below. CI (Central Instance): In NetWeaver 7.0, this is the Instance that has Message Server and Enqueue Server. 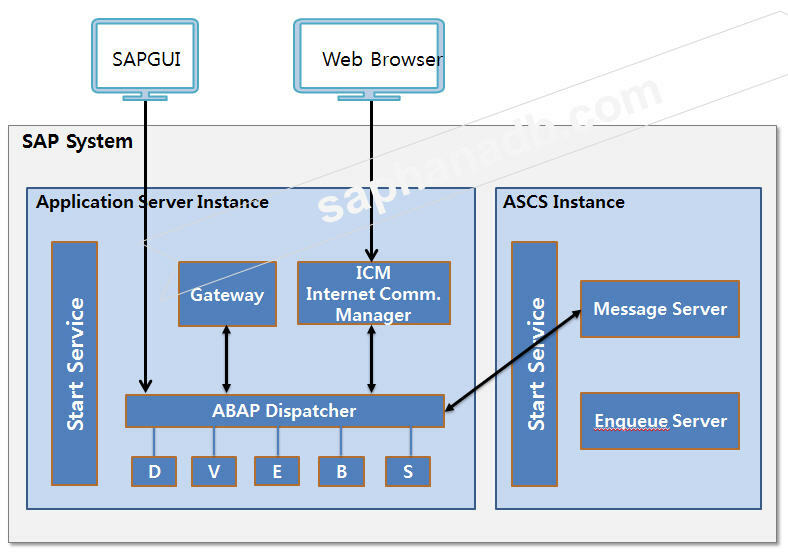 The Central Instance consists of ABAP Message Server (ABAP), ABAP Dispatcher, ICM, GW, Dialog, Update, Enqueue, Background and Spool Work Processes. There is a Message Server and Enqueue Process We will discuss these two features in more detail. The Message Server performs load balancing when logging in as SAPGUI, and also communicates between ABAP Dispatcher in Application Server. DI (Dialog Instance): Instance used to extend Application Server in NetWeaver 7.0. As the number of users increases, you can continue to add DI to configure the SAP System. Dialog Instance consists of ABAP Dispatcher, ICM, GW, Dialog, Update, Background, Spool Work process. Here, Instance refers to an instance where there is another work process except for Message Server and Enqueue Process where Central Instance exists. 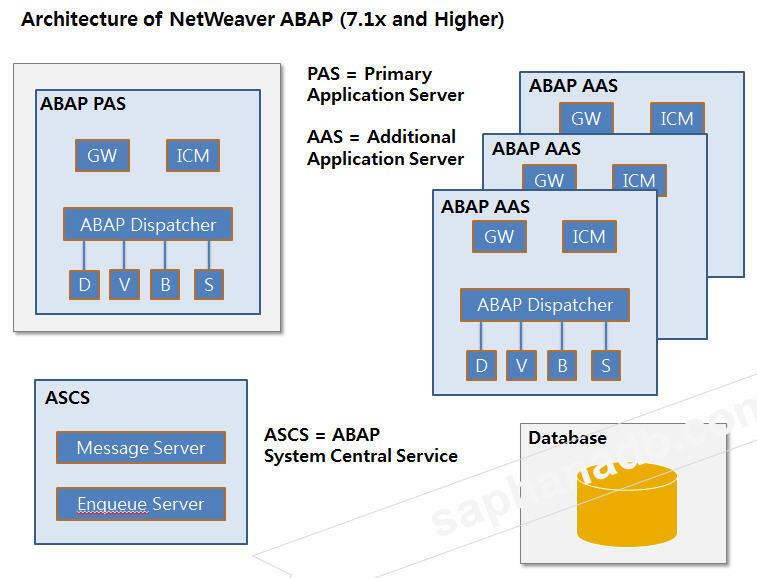 9.SAP NetWeaver AS ABAP System 7.1 or later versions will be described for each Application Server Instance. Message Server(MS) : Performs communication between the Dispatcher of the SAP Instance and the Dispatcher of the other SAP Instance. Enables high-capacity processing in the SAP System environment where Dialog Instance exists. There must be at least one Message Server in the SAP System. Enqueue Server(ES) : The Enqueue Server manages table locks in ABAP programs. There must be exactly one SAP System. 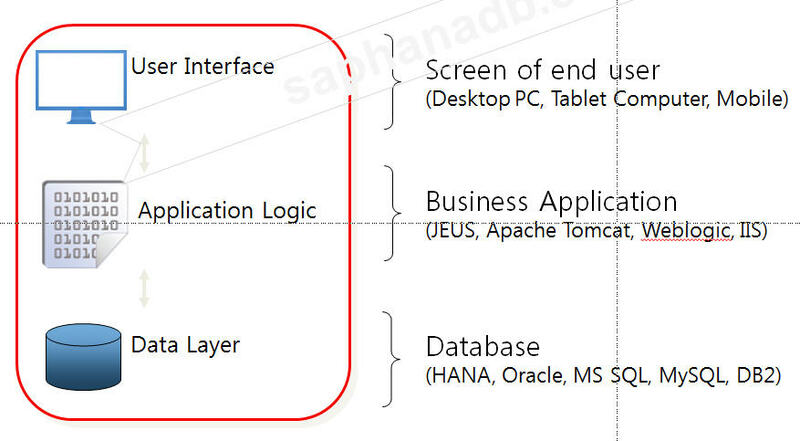 Gateway Process(GW) : The gateway process communicates between the SAP System and other external application systems. Internet Communication Manager(ICM) : The Internet Communication Manager is responsible for handling HTTP requests such as Web Browsers. Dispatcher : The Dispatcher is responsible for delivering to the work process what the user is requesting for the report execution or table query. If one work process is working, it transfers the requested contents to other resting work processes and distributes the requested contents. Dialog Work Process : The Dialog Work Process is responsible for performing the request that the user queries the table as an entity. Spool Work Process : The Spool Work Process plays a part in that the printer is executed by transmitting DATA to the printer when the user wants to print. You can configure multiple SAP systems to suit your environment. However, you must have at least one Spool Process. Update Work Process : The Update Work Process is responsible for making requests to update the data. At least one server must exist. Update Process (UP) performs the dynamics to perform the request of high priority V1. UP2 (Update 2 Processes): The Update2 Process is responsible for performing low-priority updates. Background Work Process : The Background Work Process is used when scheduling a batch job. It is used when you need to work at night or regular time. I will explain the configuration for each Application Server Instance for SAP NetWeaver AS Java 7.1 or later. 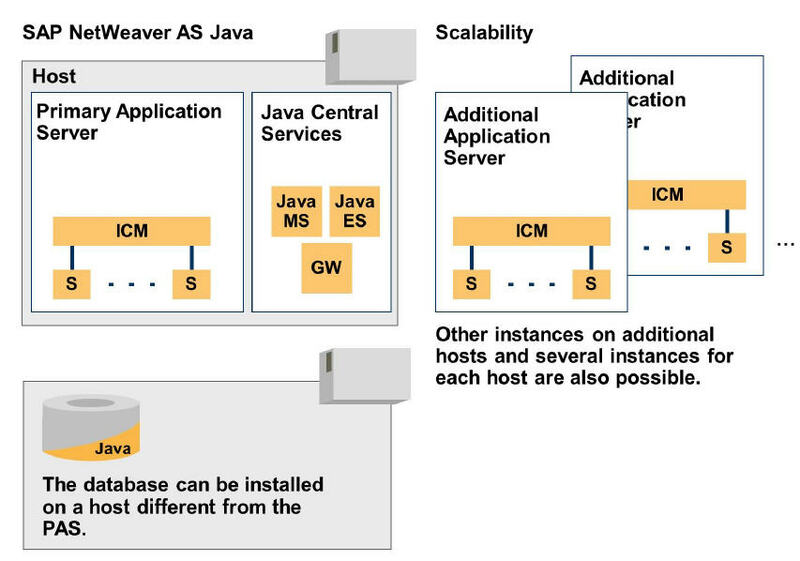 The difference between NetWeaver AS Java version 7.1 and later is Java-PAS, which consists of ICM and Server Process. SDM and Java Dispatcher no longer exist, all of which are managed by ICM (Internet Communication Manager). Java-Primary Application Server(PAS) : Java-PAS consists of ICM and several server processes. ICM receives user requests and sends them to Server Process to process business. Java-Central Service(CS) : Java-CS is composed of Java message server (MS), Java ES (Enqueue service) and GW (Gateway) process. Java-Additional Application Server(AAS) : Java-AAS consists of ICM and Server Process, which can be installed continuously on several servers, and can be installed on multiple servers when users access a lot. 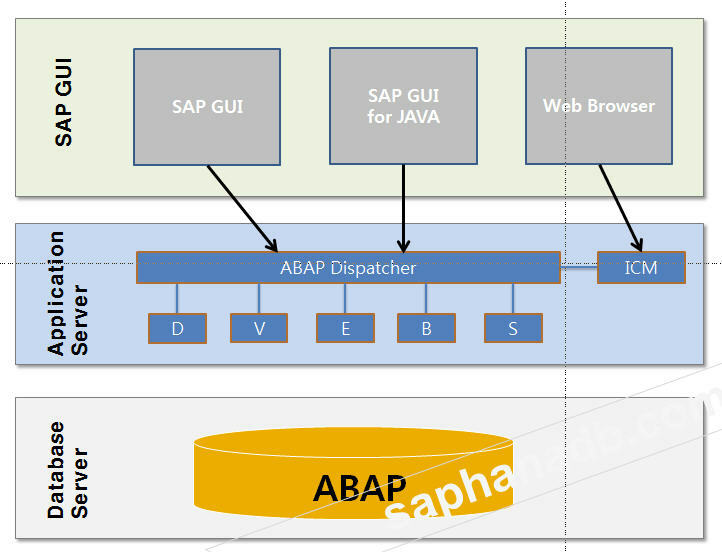 SAP Application Server (AS) ABAP + Java. 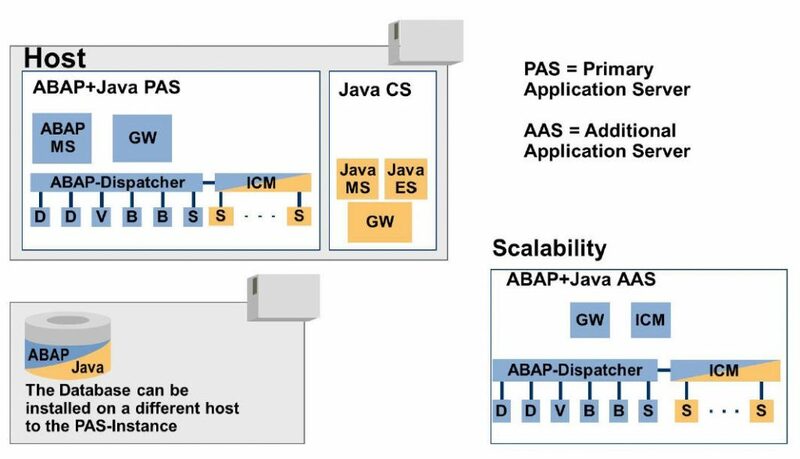 In this system, PI (Process Integration) and SAP Solution Manager 7.1 are composed of Application Server (AS) ABAP + Java. However, starting with SAP NetWeaver 7.3 or later, we do not recommend configuring SAP AS ABAP + Java coexisting on a single server. So, if you have an existing SAP AS ABAP + Java configuration, you can use a separate splitting tool to separate ABAP and Java. 12.We will explain access to SAP NetWeaver 7.1 or later through SAP GUI and Web Browser. 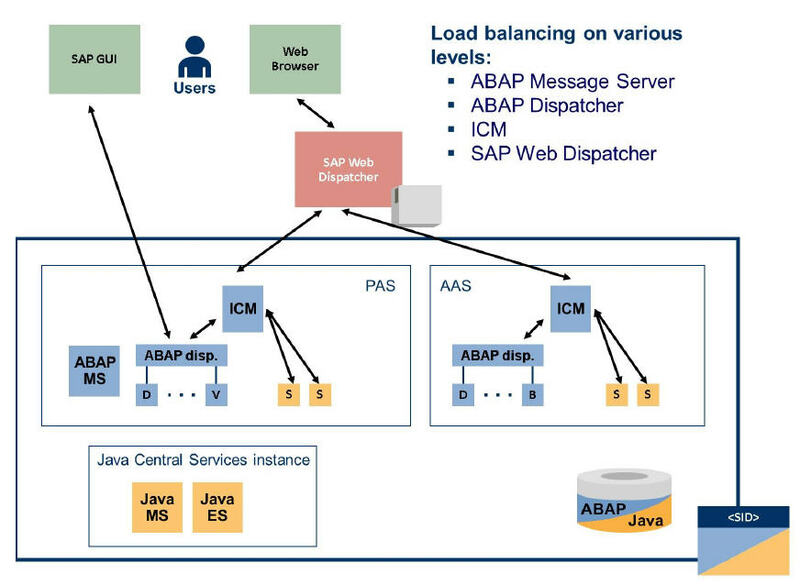 SAP GUI is responsible for load balancing the Application Server in the Message Server to connect to multiple SAP servers by setting up Load Balancing as the SAP Logon Group. 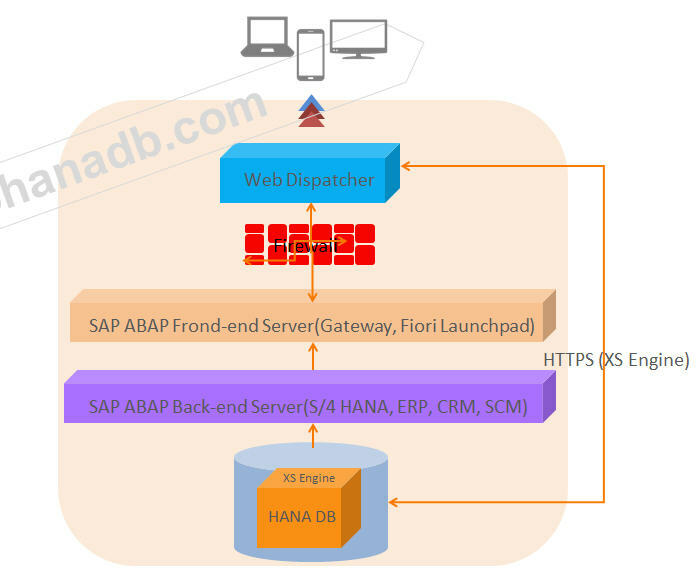 Accessing through the Web Browser allows access to multiple application servers using the SAP Web Dispatcher. This Web Dispatcher performs the Load Balancing role. 13.Now let me explain how to configure SAP S/4 HANA. In order to configure S/4 HANA, the emphasis of SAP is to support the user interface (UI) for mobile phones, tablet, etc. In order to support various PC environment, it is necessary to use Fiori which is a UI based on HTML5. So, to implement SAP S/4 HANA, you need to configure the S/4 HANA Architecture, including Fiori using HTML5. 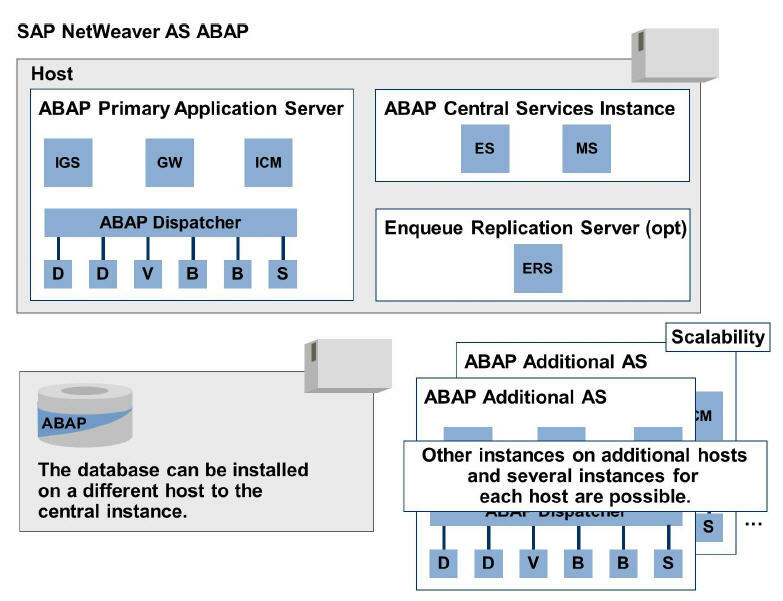 SAP ABAP Back-end Server is what we know so far with SAP ERP 6.0. 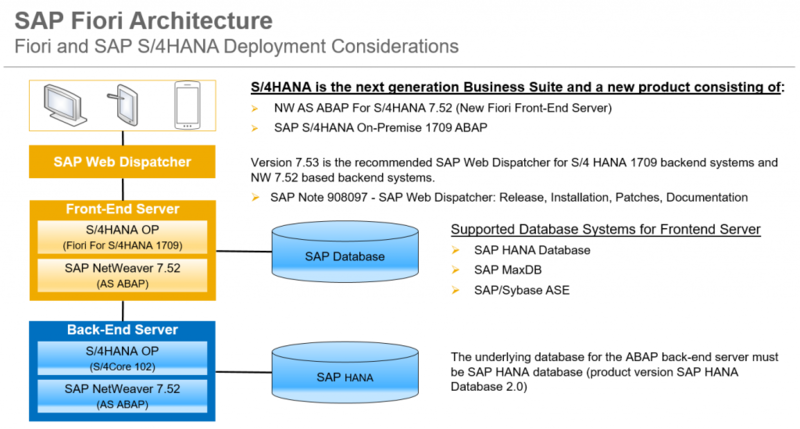 If you do not build S/4 HANA, then you can only use SAP ERP 6.0 by configuring only the SAP ABAP Back-end Server. 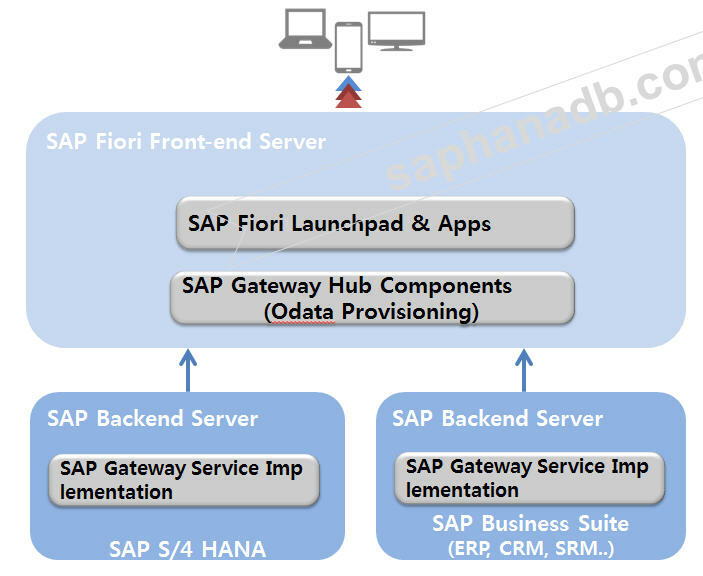 However, to use S/4 HANA, you need to build Fiori Launchpad. Next comes the moment when we have to worry. 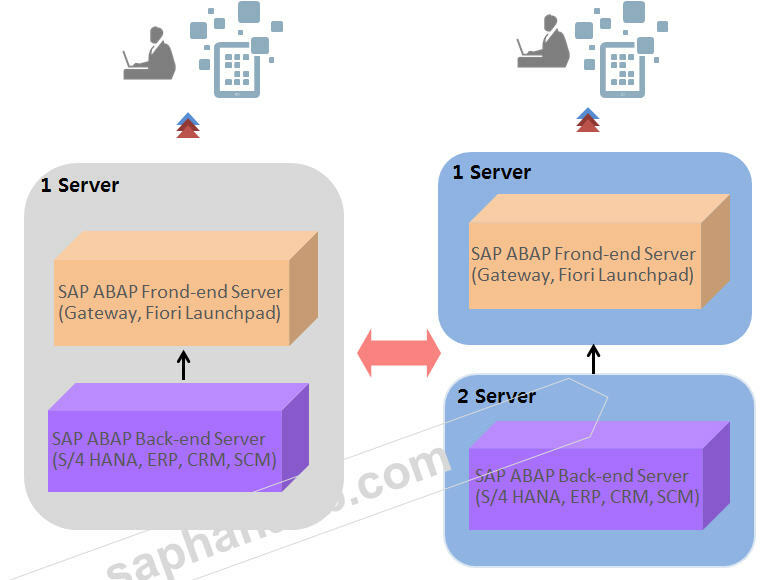 You need to decide whether you want to configure the SAP ABAP Front-End Server that was not in SAP ERP 6.0 to be a separate server or to be included in the S/4 HANA. The most common method is to install the SAP Backend Server and the Front-end Server on the same server on the same server as the S/4 HANA development server and the verification server. -end Sever and install and configure the SAP Backend Server on another server. 15.When configuring the SAP Fiori server, if you configure Front-End Server on one server, you can configure SAP MaxDB or SAP Sybase ASE as Database without using HANA DB. This means that the Oracle Database can not be configured as a Front-End Server DB. And the back-end server of S/4 HANA must use SAP HANA DB.